This is CEL Nutrition’s “Giving Back” promise with The Brain and Behavior Research Foundation, and dammit… How am I supposed to review this product now? That’s awesome, regardless of the quality and content of the formula! The leading ingredient, guarana, supplies more caffeine than coffee to an unknown degree, thanks to NervaCORE’s dosage-masking proprietary blend. L-Tyrosine, Alpha-GPC, Vinpocetine, and Hup-A justify NervaCORE’s nootropic identity, accompanying guarana’s stimulation with mood and memory boosts. Other Ingredients: Gelatin, Magnesium Stearate, Silicon Dioxide, Titanium Dioxide (color), and Rice Flour. Directions for NervaCORE: Consume 1-2 capsules daily, preferably with a light meal. Take 30 minutes prior to mental and physical activity. Take consistently for optimal effect, but take 2 days off per week to prevent tolerance. Do not exceed 4 capsules within a single 24 hour period. B Vitamins – Cerebral circulation, energy support, mood-elevating chemical balance — the bio-effects of B vitamins are integral to healthy cognition, particularly B6 and B12 for nootropic cognition. More on B Vitamins. Vinpocetine – More cerebral circulation brought by this semi-synthetic periwinkle compound, delivering more oxygen and nutrients to the brain. More on Vinpocetine. BioPerine® Black Pepper Extract – Smart addition to any supplement for piperine’s nutrient absorption enhancing effects. 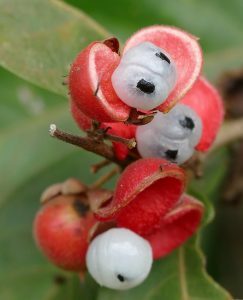 Paullinia Cupana – Or guarana, a seed that contains more caffeine than coffee beans, consumed primarily for its stimulative properties. Not a true brain-enhancing nootropic. More on Guarana. L-Tyrosine – One of the most reliable anti-stress compounds for its replenishment of feel-good neurotransmitters during high active, stressful conditions. More on L-Tyrosine. L-Taurine – Viewed as a sedative compound with an antioxidant upside, although not quite the research-backed cognitive enhancer I enjoy. More on L-Taurine. Alpha-GPC – I prefer citicoline for its supply of choline and cytidine (precursor to uridine), yet alpha-GPC contains a higher choline concentration than citicoline. More on Alpha-GPC. Acetyl L-Carnitine – ALCAR crosses the blood-brain barrier to energize brain cells, albeit elderly brain cells. (May not work for younger, healthy users.) More on ALCAR. Huperzine A – Best known for its inhibition of acetylcholinesterase, an enzyme responsible for the breakdown of neurotransmitter acetylcholine. More on Huperzine A. Energy – The leading ingredient being caffeine-laden guarana. Mood – B vitamins, L-tyrosine, L-taurine assist with feel-good brain chemicals. The result: Acute, energized motivation to tackle what’s in front of you NOW, with the upside of memory and learning enhancement via alpha-GPC + hup-A’s promotion of acetylcholine, a neurotransmitter heavily involved in long-term thinking, memory, etc. 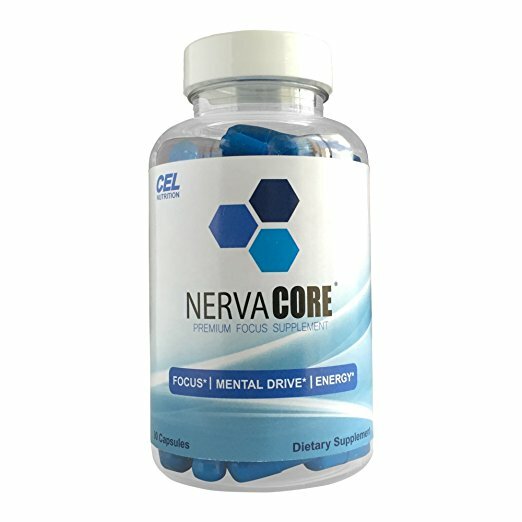 It’s a bummer that NervaCORE takes the proprietary blend route, obscuring the individual ingredient dosages (therefore, diminishing the product’s overall credibility), because the ingredient roster actually makes up a somewhat impressive PWO product with a nootropic edge. To be taken before working out, taking a test, gaming, or whatever else it is you kids do these days. NervaCORE chooses the proper ingredients for a nootropic/PWO hybrid supplement, despite sacrificing true nootropic action for caffeine. The alpha-GPC, hup-A, and vinpocetine additions help round out the nootropic “cognitive enhancing” aspect to this formula. BioPerine is always a plus to manufactured supplements for the extract’s enhancement of nutrient absorption. The proprietary blend masks the individual ingredient dosages, a bad look made even worse by the blend’s questionably low dosage. The ingredient quality could be improved nearly across-the-board, e.g. B6 upgraded to P-5-P, L-tyrosine to N-Acetyl-L-Tyrosine, guarana for guarana extract. The “Other Ingredients” are junky, coating NervaCORE’s pills with unnecessary titanium dioxide colorant and Magnesium stearate, a nutrient absorption inhibitor (the opposite of BioPerine). According to CEL Nutrition: “Athletes are raving about NervaCORE®.” A fitting ad descriptor for a CEL Nutrition product that seemingly seeks to bridge the gap between bodybuilders and geeks. Evidenced by the customer reviews evidently wide spectrum of users. Peace, love, curls, computers, namaste! 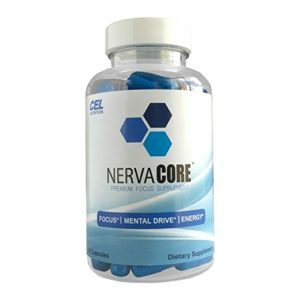 You can buy NervaCORE through a few online retailers, including Amazon, Bodybuilding, and Lucky Vitamin. At worst NervaCORE works as well as a caffeinated energy shot, essentially hitting the same caffeine + B vitamins + aminos profile. And that’s not a bad bottom line for a cognitive enhancer, given you’re only spending $1.22 per serving (or essentially half that if you buy NervaCORE through Amazon). Recently, I’ve incorporated natural guarana into my pre-workout stack to a positive cognitive effect, which is why I recommend NervaCORE as a PWO over a straight nootropic supplement. If long-term brain enhancement is your ultimate goal, you have other awesome nootropic options. Otherwise, NervaCORE works for short, quick boosts on stimulative brainpower.